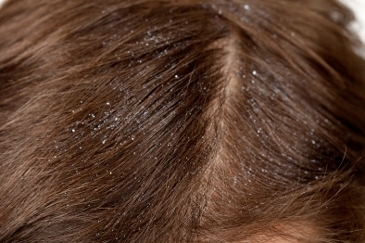 Dandruff is characterized by flaking of the scalp due to extreme temperatures, dry scalp, oily scalp, excessive use of hair products, infrequent shampooing, sweating, poor nutrition, chronic illness, overgrowth of malassezia (yeast-like fungus), skin issues such as eczema, psoriasis, contact dermatitis, and hereditary factors. It is not a serious condition but may cause social embarrassment due to the presence of white flakes in hair. Besides, dandruff may be accompanied by problems like itching and tingling on the scalp. It tends to worsen during the winter season. • Fenugreek seeds and margosa leaves are considered effective for curing dandruff. For this, you need to soak two three tablespoons of fenugreek seeds in water overnight. The next day, grind the seeds along with six to ten neem leaves (margosa or Indian lilac), half a cup of yogurt, and lime juice taken from half a lime. Apply this paste on your scalp and hair. Rinse it off with a mild shampoo after half an hour. Follow this treatment two times in a week. It is suggested to oil your hair before applying this recipe. • Coconut oil is another popular home remedy for dandruff. Thus, you can heat coconut oil mixed with a little black pepper. Strain the oil with the help of a fine cloth and massage this oil in your hair and scalp before going to bed. Alternatively, you can add a few drops of lemon juice or eucalyptus oil in warm coconut oil. • Massage your scalp with flaxseed oil and then wrap a warm towel around your head or cover with a shower cap. Shampoo your hair after 20 minutes. Next, put two cups of warm water in a spray bottle and add two tablespoons each of apple cider vinegar and hydrogen peroxide in it. Spray this solution on wet hair and wash it off after a few minutes. Check out this video giving tips on how to get rid of dandruff naturally. • Boil a cup of water mixed with three to four tablespoons of dried thyme for about 10 minutes. Strain and cool the infusion. Wash your hair and use this solution as a final rinse. • Mix two tablespoons of vinegar in six tablespoons of lukewarm water. Spray this solution on your scalp and shampoo your hair in the morning to heal dandruff and make your hair appear shiny. Besides, you can massage the scalp with a combination of two teaspoons of vinegar and one teaspoon of lemon juice. • Prepare an anti-dandruff hair care recipe by whisking two egg yolks and mixing half a cup of apple cider vinegar and one-third cup of olive oil in it. Leave it on your hair for about half an hour and then wash it off. Apart from removing dandruff, it makes your hair soft, silky, and shiny as well. Use this mask on a weekly basis. • Regularly rubbing aloe vera gel on your scalp and washing your hair after 10 minutes is another easy way to reduce dandruff naturally. • Simply adding powdered aspirin tablets in your shampoo and then using it can also help alleviate dandruff. • Blend two bananas (you can make use of over-ripe bananas) and two teaspoons each of olive oil, organic honey, and lemon juice in a blender or food processor. Apply this creamy paste on your hair and scalp. Shampoo and condition your hair after 20-30 minutes. This hair mask is extremely useful for those who are dealing with dandruff and frizzy hair. • Applying a combination of two cups of plain yogurt, one tablespoon of organic honey, a tablespoon of castor oil, and three to five drops of tea tree oil is highly beneficial for controlling dandruff. Follow this remedy at least once in a week. You need not shampoo your hair after using this mask. Just wash it out and condition your hair after 30 minutes. if there are remedy – or help for fungus .